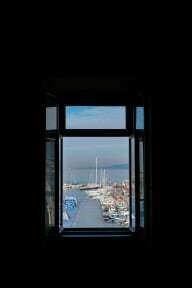 ControVento is a brand new hostel located in the historical centre of the Trieste, just in front of the sea. The main square, piazza Unità, is at 5 minutes walk and the nightlife is literally out of the door. Inside, all the precious details of the 19th century building meet the minimalist handmade furnishing and some vintage touch. ControVento has a perfect location in the centre of Trieste, all the main attractions are at walking distance. The so called Cittàvecchia neighborhood is at 500 metres distance from the main square and offers shops, bars, restaurants, but also atm, supermarket, pharmacy... Nearby you can find interesting art galleries, museums (Revoltella, Sartorio, Marine Aquarium, Oriental Art, Alinari Image) and Salone degli Incanti exhibition hall. San Giusto castle and its cathedral are 10 min walk uphill. The vibe is very laid back an homie: there are only 4 bedrooms with 2 shared bathrooms, one for women and one for men, and an equipped kitchen. There is also a big open space filled with natural light, books, music and plants where everyone can chill-out and meet new friends! Last but not least, the breakfast is included and the wi-fi is free and reliable. Check in from 15:30 to 22:00. Check out from 07:30 to 10:30. Great place to stay. Books up fast ! So if like me you book 1 night somewhere to gauge the vibe, book two! An amazing hostel! Funky style at the hangout area - just perfect! The staff are amazing! Overall I had an amazing time! Definitely recommend! This place is truly awesome. It’s in a great location, the staff are soooo kind, absolutely wonderful people!!!! Italians in general are just the nicest people. Their breakfasts were great, had fruit and toast, and the beds were comfy and didn’t squeak. Showers were clean and there were enough toilets/showers for everyone. A great place to stay in Trieste, the staff are extremely kind and generous. Loved it, definitely would recommend. Great place. Staff were amazing, place was super clean and nice chill out common space. Would definitely stay there again if in Trieste. Thank you Marco! The location is super. The house is a Palazzo, very beautiful. In terms of breakfirst eberything is there, very nice coffee. I absolutely loved this hostel! 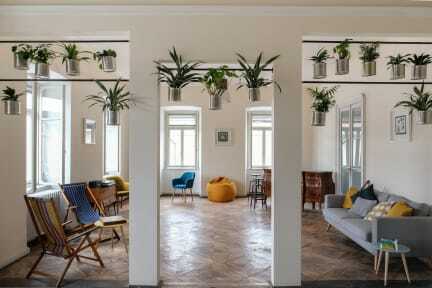 Very cute and historic due to the building, but the furnishings are so modern and clean with bright colors. A little drafty and creaky due to the age, but overall not a problem. The common room and kitchen were also some of the nicest I’ve ever used. Hoping to stay again! Great location, helpful staff, comfortable common room and well equipped kitchen! Can’t ask for much more! Nicely decorated, clean, cozy hostel. The staff is superhelpful! I would definitely stay there again.